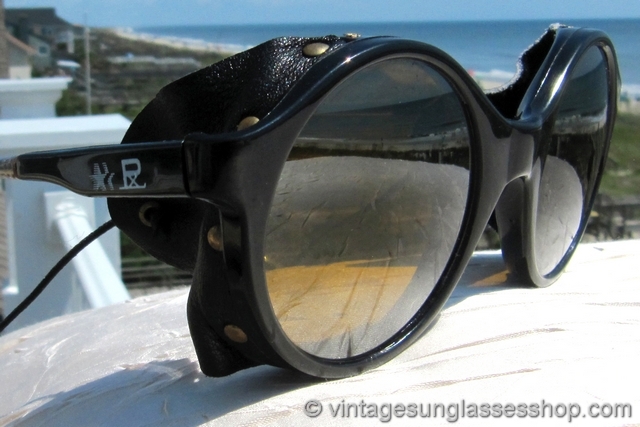 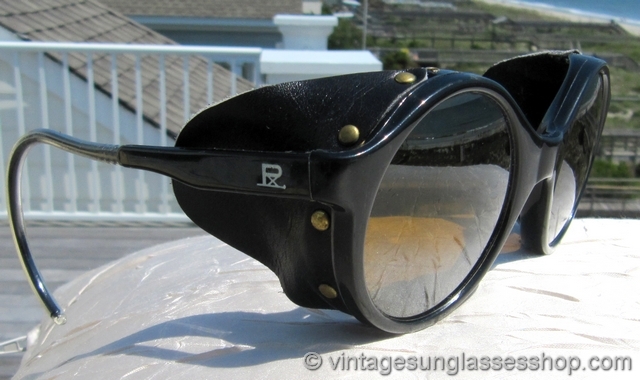 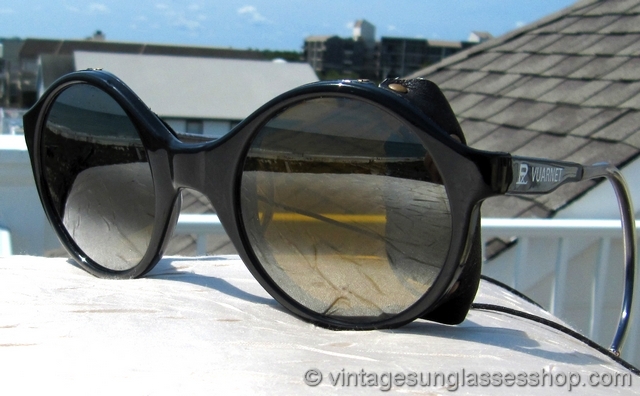 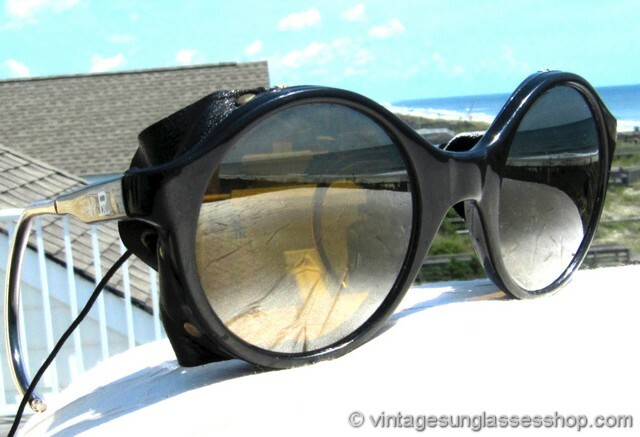 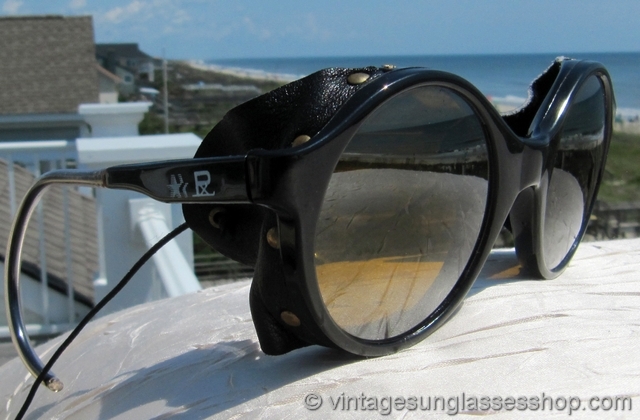 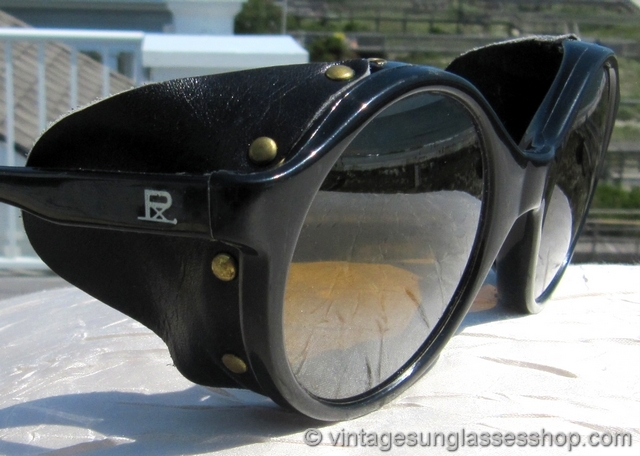 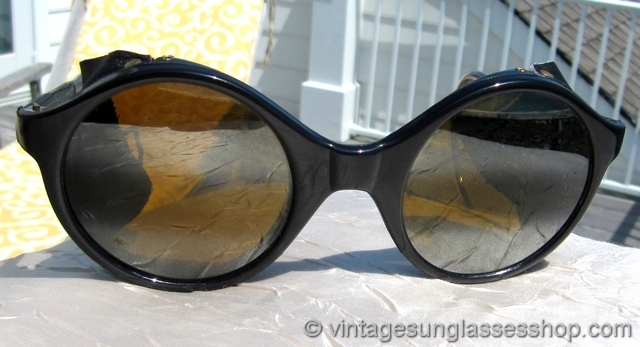 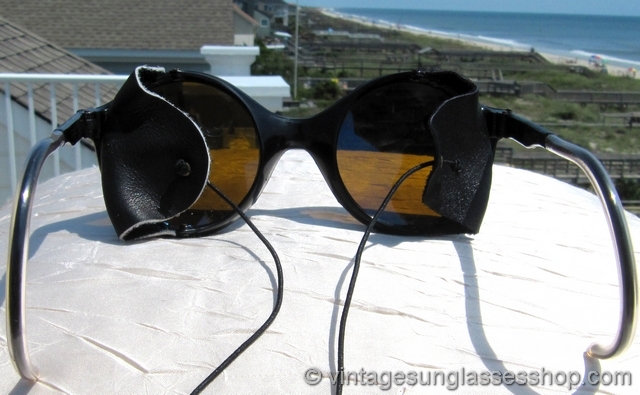 1 Vintage Vuarnet 028 Skilynx glacier glasses c 1983-1984 feature distinctively round Vuarnet Skilynx lenses with black leather side blinkers, a high performance yet incredibly stylish Vuarnet interpretation of glacier glasses. 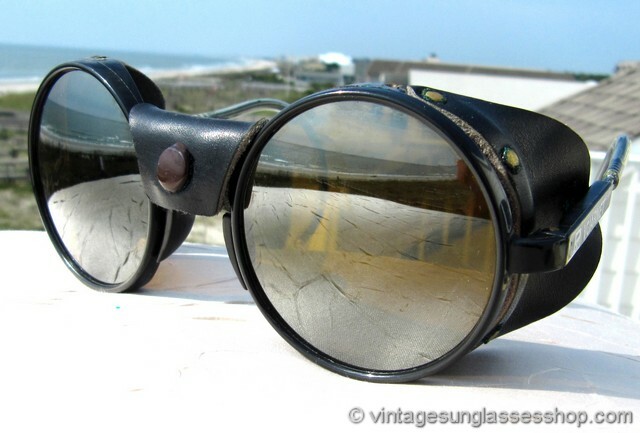 You don't see too much ski eyewear with round lenses, and it gives these Vuarnet glacier glasses a super cool retro look. 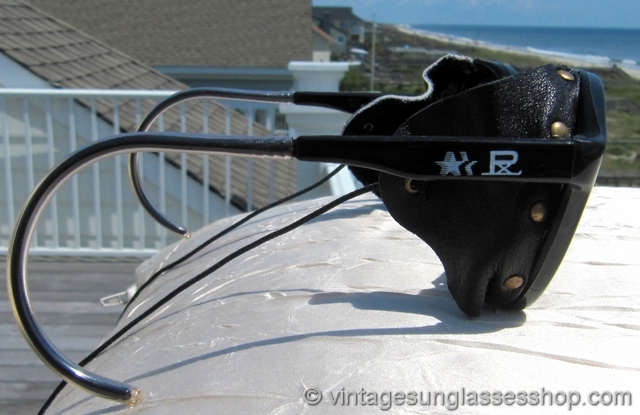 The adjustable shooter ear stems are flexible and curve behind the ear to give you the most secure fit possible, and the cord and leather blinkers will also keep your eyes secure and warm. 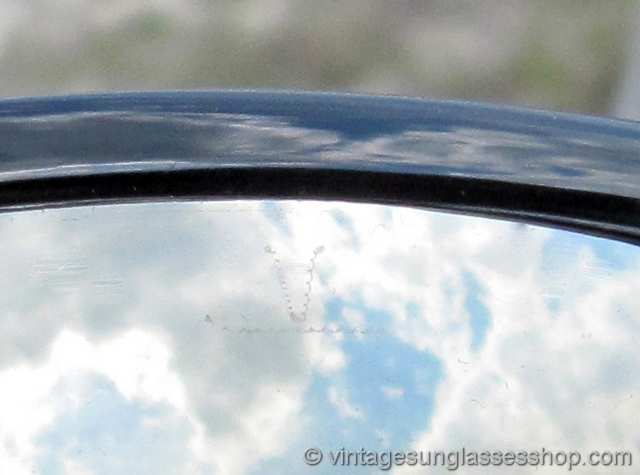 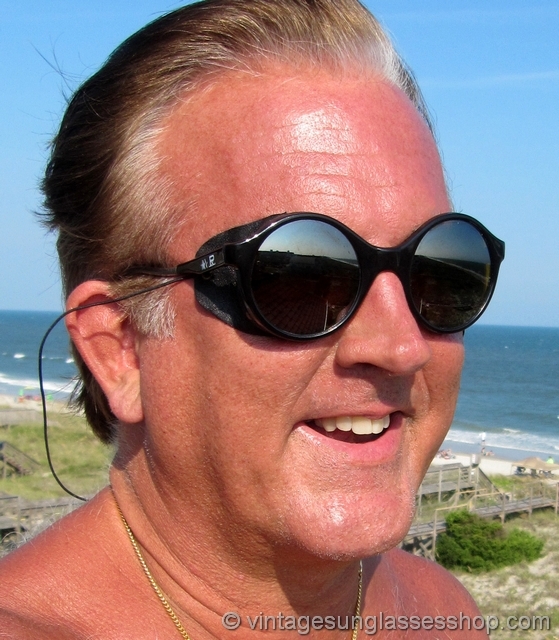 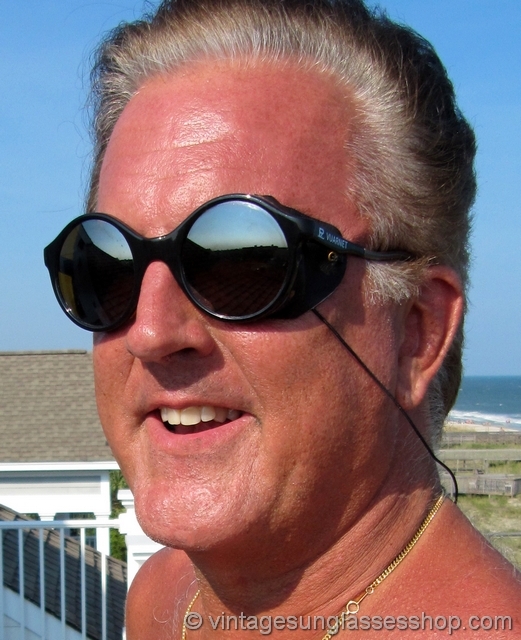 Vuarnet PX4000 Skilynx lenses are amber-yellow base mineral glass lenses with anti-reflective interior coatings and double gradient silver mirror exterior filters. 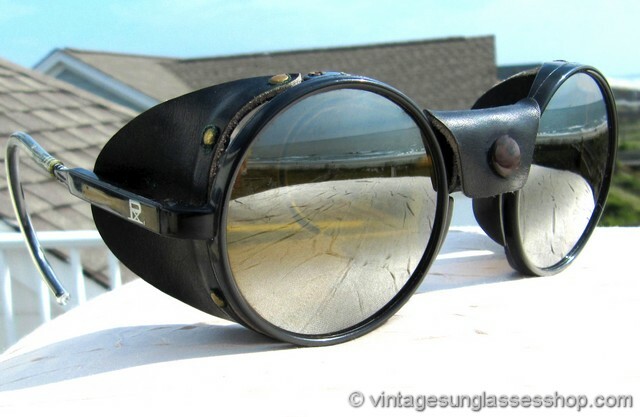 This legendary Vuarnet lens eliminates glare and reflection, enhances contrast and depth of field, and	has	long been known as "the essential lens for in the mountains and at sea." 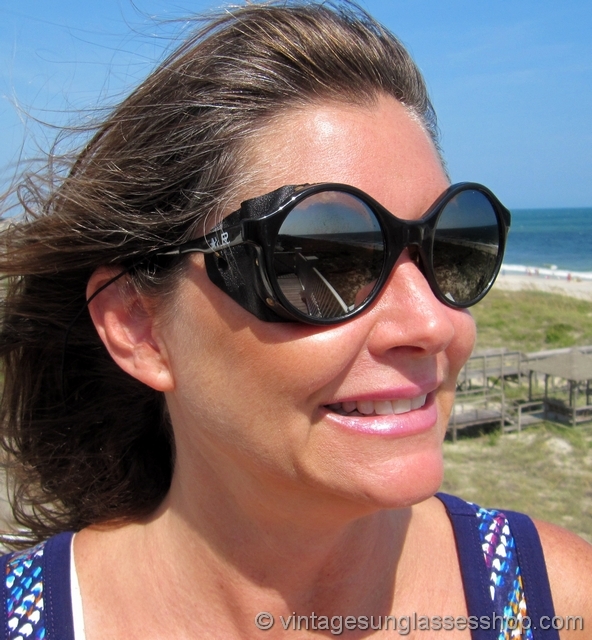 The unisex Vuarnet 028 black nylon frame measures approximately 5.5" temple to temple, and the round Vuarnet Skilynx lenses measure approximately 1.875" in diameter with both lenses laser etched. 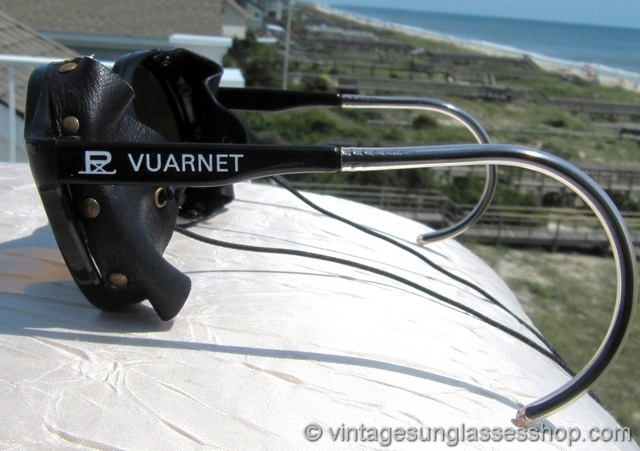 You'll find the Vuarnet PX logo on the exterior of one stem along with the repeating star symbol of the 1984 Los Angeles Olympic Games for which Vuarnet was a global sponsor and PX Vuarnet on the other stem, and the inside of one stem is impressed France and Nylon along with the French crown trademark. 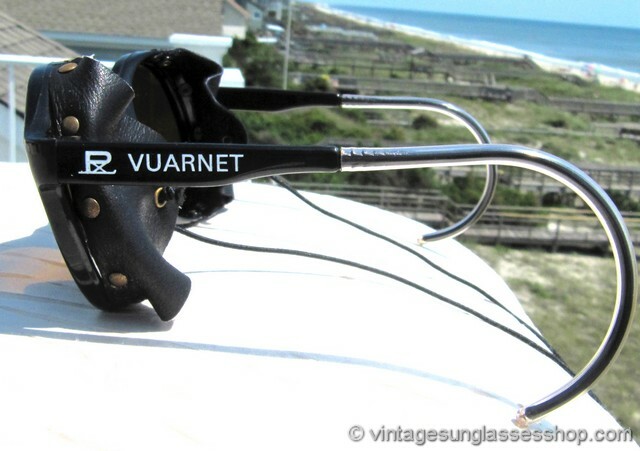 2 During the later years of the 1980s, Vuarnet dropped the repeating star symbol of the 1984 Los Angeles Olympics and just left the PX symbol on the right ear stem while the left stem remained PX Vuarnet. 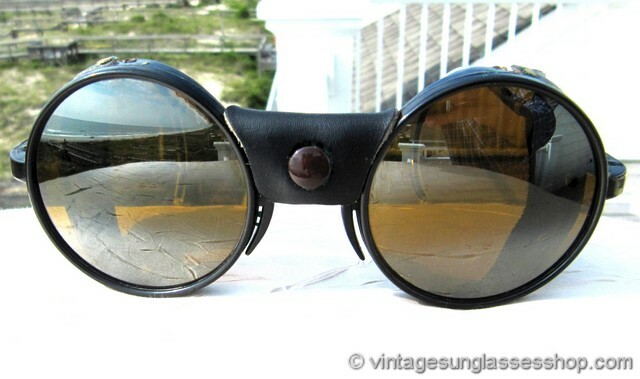 They are otherwise identical in size, shape, appearance, and marks. 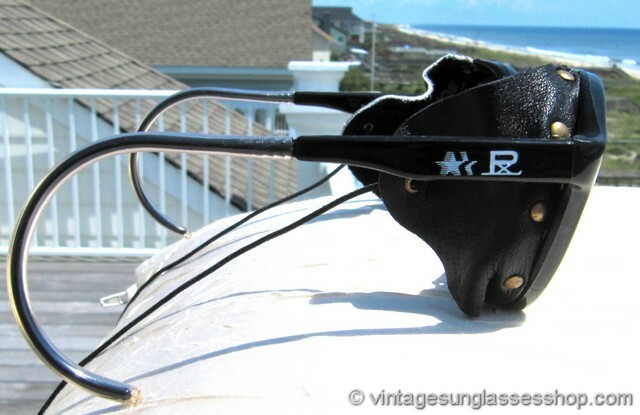 3 If you ski in extreme conditions, you might like these identical Vuarnet 028 Skilynx black glacier glasses with a snap on leather nose guard to go with the standard black leather side blinkers. 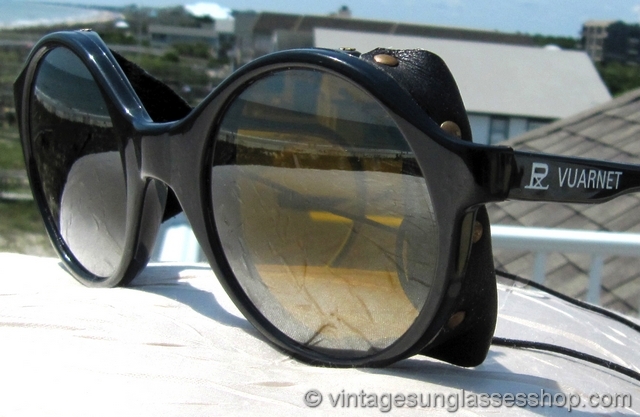 Aside from the inclusion of the nose leather, they are otherwise identical in size, shape, appearance, and marks.